(official press release) LACOSTE challenged Chinese artist Li Xiaofeng to create two different polos for the 2010 Holiday Collector’s Series. For both, he had to adapt his work methods slightly. 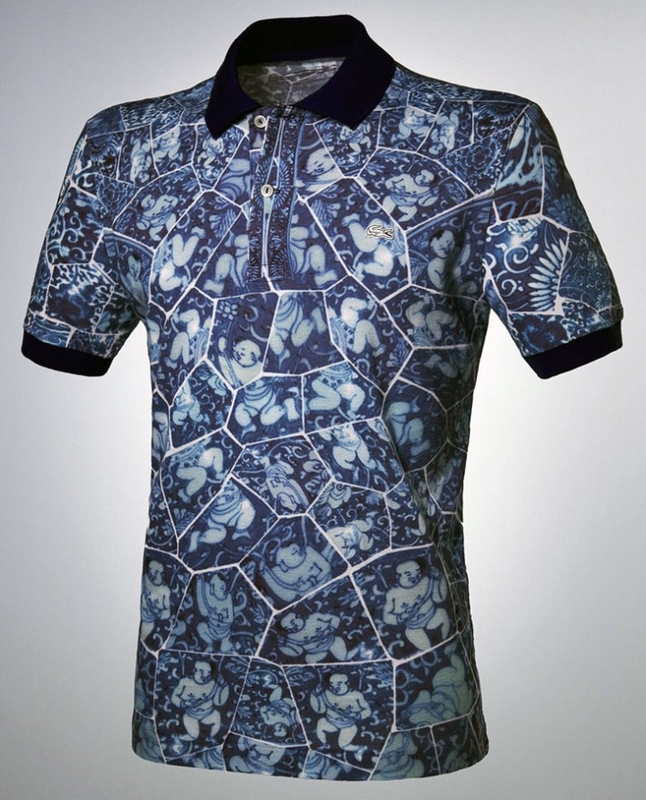 For the limited edition printed polo, he chose blue and white shards with lotus and children designs from the Kangxi Period (1662 - 1772 AD) of the Qing Dynasty (1644 - 1911 AD). The lotus grows from mud underwater to emerge as a flower, symbolising purity and rebirth. Images of babies represent fertility, as during that period the high infant mortality rate meant that people decorated ceramics with babies hoping they would be blessed with children. This particular type of folk ceramics reflected the Imperial taste at that time and was only used by the upper classes, as techinically the painted blue background on a white base that delineated the figures was more complex to produce. Xiaofeng shaped and polished the shards as usual, but instead of drilling holes and linking them with wire he photographed each (251 for the men’s polo and 304 for the women’s) and placed them one by one in a life-size digital pattern of the polo’s front, back and sleeves. He chose a dark blue ribbing for the collar and sleeves on the men’s polo and a light blue for women. The final touch was the addition of a white LACOSTE crocodile logo, the rarest breed in the brand’s collection. The printed Porcelain Polo is limited to 20,000 pieces for both men and women and comes packaged in a silk pouch stamped with the red seal LI XIAOFENG LACOSTE logo above. 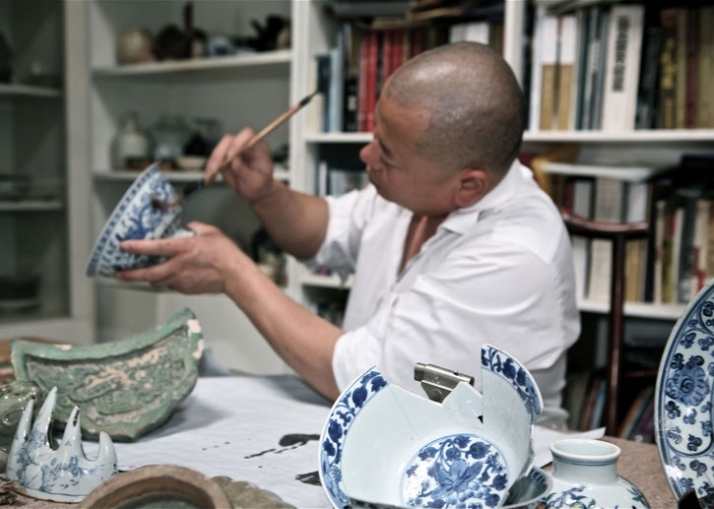 China forbids the export of ancient artefacts including porcelain shards, so for the Porcelain Polo art work, Li decided to use new shards so that the piece could eventually be shipped out of the country. Inspired by the early Ming Dynasty (1368 -1644 AD), he painted porcelain bowls with images of a scholar contemplating a scenic landscape surrounded by what is referred to as the ‘Four Gentlemen’ in classical Chinese painting, namely an orchid, bamboo, chrysanthemum and plum blossom. He chose to use under-glazed red in addition to the quintessential Ming blue and white. Red represents blood and life force; traditionally, Chinese brides wear red, so it is also a colour associated with festivity and joy. Xiaofeng drew the LACOSTE crocodile logo and letters on the bowls as well as the phoenix, an important symbol of good fortune, opportunity and luck in Chinese culture. 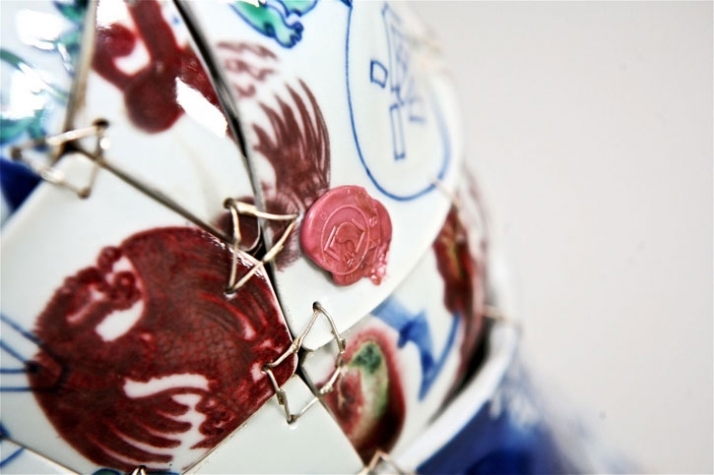 The artist also brushed some traditional Chinese well-wishing expressions on the bowls, making sure to have the characters broken up into different shards so that the characters are fragmented and no longer evident on the completed sculpture. 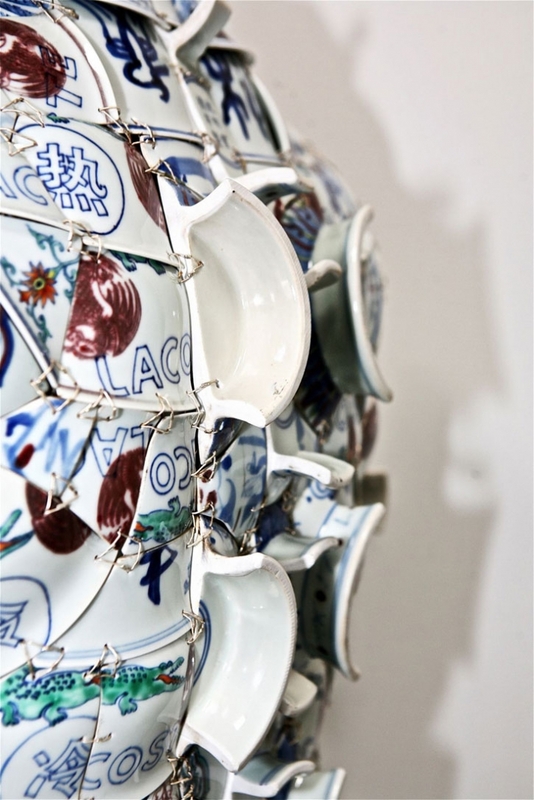 His idea here was to reflect the mixing of the old and the new which echoes contemporary Chinese society. 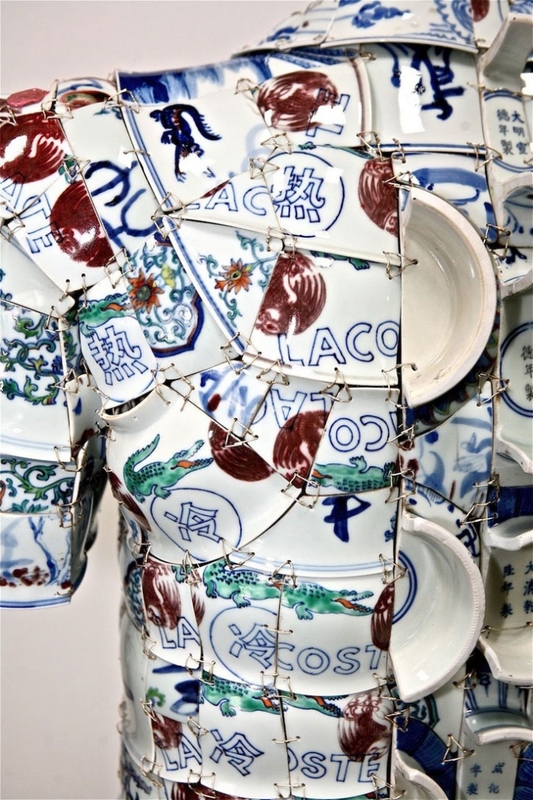 At the back of the Porcelain Polo, Xiaofeng used two parallel rows of the half-circle broken bottoms of the bowls to represent the raised scales of a crocodile. At the center of the polo, Xiaofeng inverted the LACOSTE crocodile logo and letters, following the Chinese tradition of turning characters upside down for good luck. 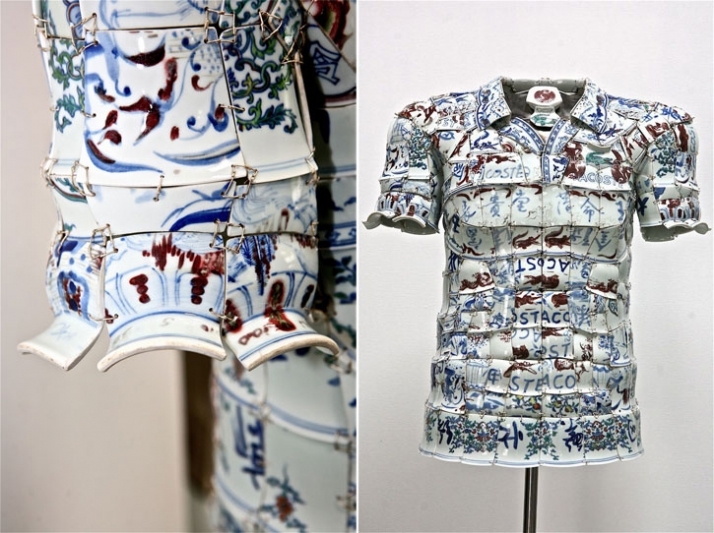 It took Xiaofeng three full months to paint, fire, fragment, shape, polish, and finally link together the 317 shards to create the Porcelain Polo, which is the most expensive and most exclusive LACOSTE polo to date. The Porcelain Polo will be unveiled in Paris on 25 June at the Musée des Arts et Métiers and then in Bejing in the fall at Li Xiaofeng’s first one-man show organized by the Red Gate Gallery, the first private contemporary art gallery to be established in China which was founded in 1991 by Brian Wallace who first arrived in China in 1984. Li Xiaofeng trained as a muralist but turned to sculpture to explore a new concept and expression of Chinese landscapes. 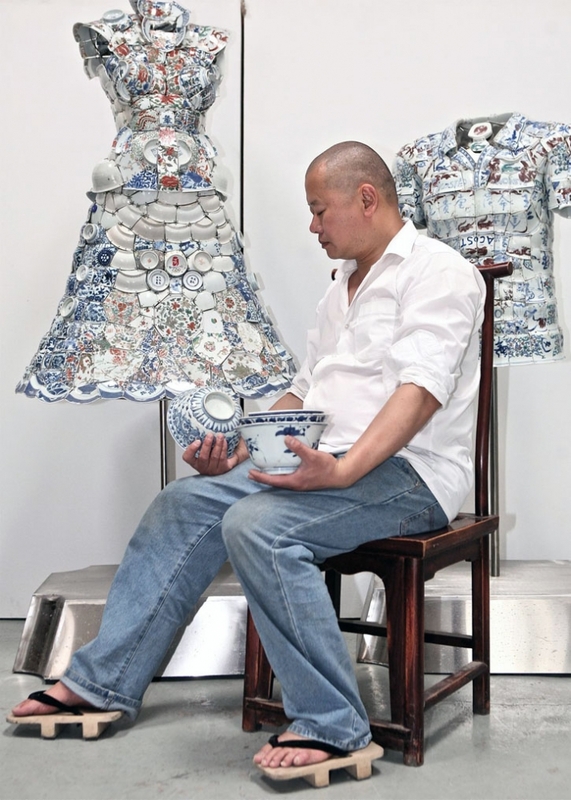 His choice of material is unexpected; instead of marble, wood or even glass, he prefers buying shards of broken porcelain recovered from ancient archeological digs, some dating from the Ming Dynasty, and then shaping and polishing them, drilling holes into each corner and linking them together with silver wire to create ’rearranged landscapes’. 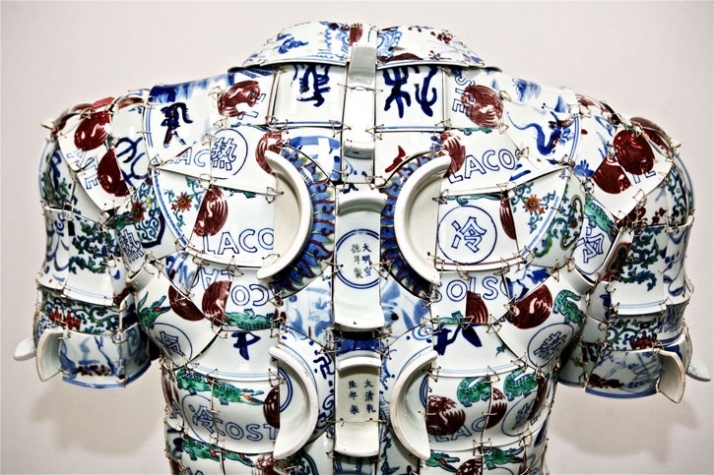 It is fitting that these poetic pieces, which have been perhaps best described as ‘post-orientalism’, usually take the form of clothing, including traditional Chinese dresses and jackets as well as neckties and military uniforms. They are ultimately ‘wearable’ although certainly promise to be as heavy as any armour and would require a strong retinue of dressers to don and doff. How did you become involved with LACOSTE for this project? John Storey first saw my works at the The Opposite House, Beijing, which he liked very much. He found out from an editor friend there that I am represented by Red Gate Gallery and got an introduction to the gallery where we met. John introduced the project concept to me, which I liked very much and agreed to it. What was your impression of LACOSTE before you started working on this project? In about 2004, my classmate Li Kuan gave me an old LACOSTE shirt. It was very comfortable to wear, and I have kept it until today. You trained as a muralist, so why did you decide to move to sculpture? It is not possible for an artist to control the direction of his or her carrier entirely. It is a tree which undergoes a process of maturity. While I was studying to become a muralist, our classes were very interesting and we learnt many things. We knew that there are many different types of muralist expression techniques. At the time, there was a ceramics class, the supervisor emphasised a lot on transmission of culture and innovation. After graduating, my artistic exploration has always been linked somehow to traditional culture. The artwork I created for my graduation was a combination of an installation and an oil painting relating to the human body. 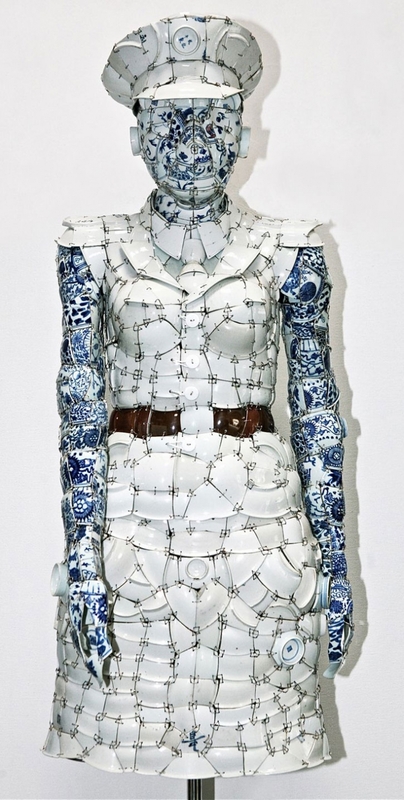 How did you get the idea to use porcelain shards as a material? Where do you find them? After graduation in 2003, I used a composition of materials to paint a series of Chinese water colour landscape paintings. To better experience the feeling of painting of ancient painters, I started to have contact with ancient Chinaware on paintings. These are totally different to the painting styles of ancient literati paintings. They are simple and sincere, which is identical to my nature. Gradually as I accumulated many shard pieces, the idea sprouted for me to create an artwork. After I created my first Mao jacket piece, I realised I had entered a totally different area than I was previously in. It was very different to the education I had received in my college, however there was also a more essential connection. Here there are many things which are worth me exploring. My first idea for the work was that it should be able to be worn for performance art. From 2004 to 2005, I have done performance art several times. This performance art pieces are related to the human body and its ideal. 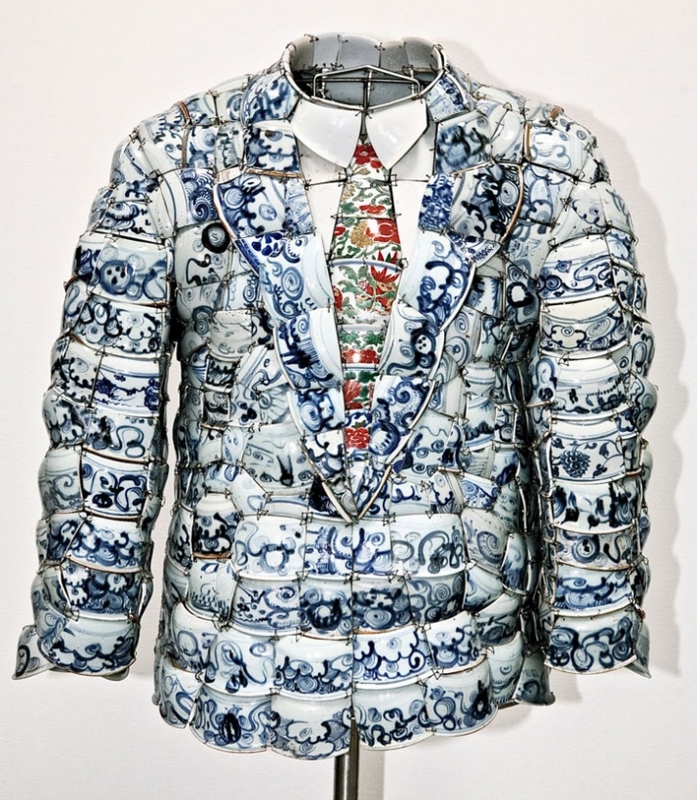 My first piece using ceramic shards was a Mao jacket. The name of the piece was “Beijing Memories”. My idea was to distill this era to a new level through art. As to how I found these shards, everybody knows that Beijing is a big city. Beijing today is a big construction site. Property developers have turned Beijing upside down. Ancient cultural relics from the Tang, Song, Yuan, Ming and Qing dynasties have been pushed up from below the surface through this process. 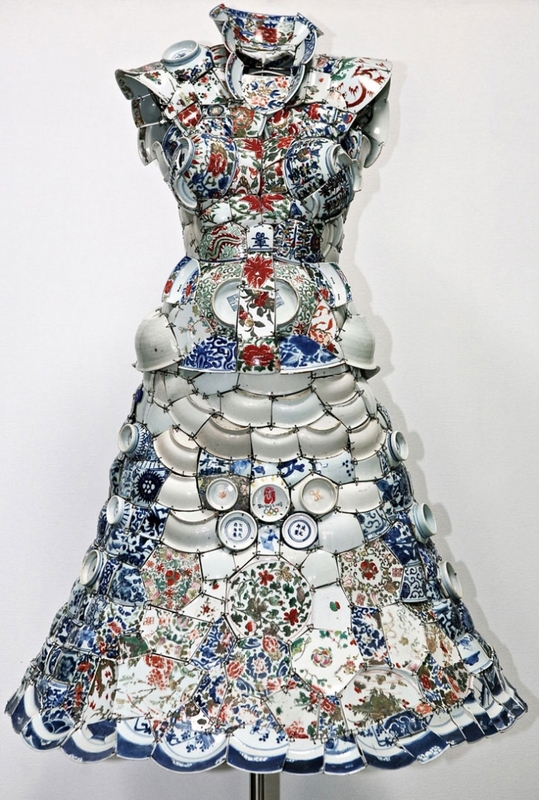 Describe the steps to make your porcelain clothing sculptures. Firstly, composing the piece is a process. I must reflect a lot about it. I must make a rough sketch, compose, reject it and start again. Sometimes, I straightaway use Plasticene or wire to create a model. After this, after confirming the period of the shards, I classify the colour of the patterns, then put together a rough arrangement of the shards, cut and polish each piece. This is a very repetitive process. I must pay close attention to the modelling as well as the original pattern colour of the shards. I then must weld the pieces and make the final adjustments. How long did it take you to create the LACOSTE Porcelain Polo sculpture? How many shards did you use ? It took me over three months to create the piece for LACOSTE. I used over three hundred shard pieces! I was trained as an oil painter. When an artist finishes a painting, no one ever calculates how many brush strokes or how much paint was used. As long as you reach the ideal effect, it’s fine. This has become one of my habits. How did you find it to use a computer program instead of your usual methods to link the shards for the printed version of the LACOSTE Porcelain Polo ? Using a computer is very convenient. It makes humans return to a virtual truth. What is different to producing the ceramic artworks is that it loses the feeling of connecting with the spirit of the people in ancient times by personally touching the ceramic shards. Nonetheless, this time when I created the printed piece for LACOSTE, it gave me a new opportunity to realise my ideas. 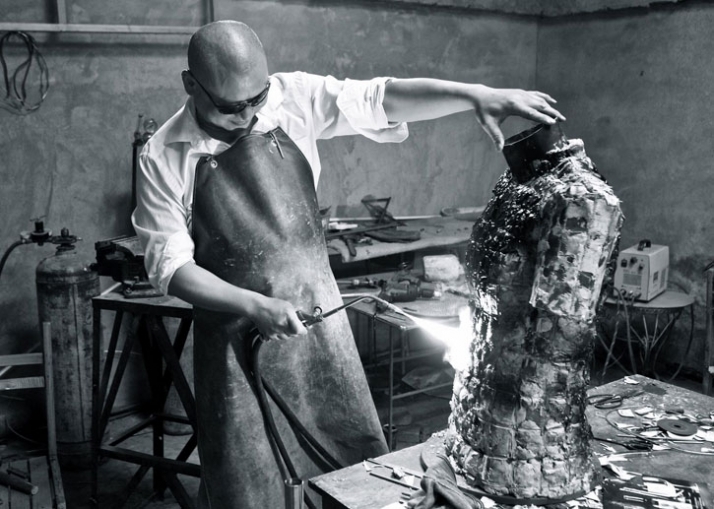 After the piece “Cheongsam” came about, I had an idea to use firing to create a new work. I could better express the things I wanted to though the patterns on the shards and the modelling. This gave a greater space for the expression of my ideas.